Clues from prehistoric droughts and arid periods in California show that today's increasing greenhouse gas levels could lock the state into drought for centuries, according to a study led by UCLA professor Glen MacDonald. The study, published today in the Nature.com journal Scientific Reports, looked at how natural climatic forces contributed to centuries-long and even millennia-long periods of dryness in California during the past 10,000 years. These phenomena—sun spots, a slightly different earth orbit, a decrease in volcanic activity—intermittently warmed the region through a process called radiative forcing, and recently have been joined by a new force: greenhouse gases. As long as warming forces like greenhouse gases are present, the resulting radiative forcing can extend drought-like conditions more or less indefinitely, said MacDonald, a distinguished professor of geography and of ecology and evolutionary biology. "Radiative forcing in the past appears to have had catastrophic effects in extending droughts," said MacDonald, an international authority on drought and climate change. "When you have arid periods that persist for 60 years, as we did in the 12th century, or for millennia, as we did from 6,000 to 1,000 B.C., that's not really a 'drought.' That aridity is the new normal." Researchers tracked California's historic and prehistoric climate and water conditions by taking a sediment core in the Sierra Nevada mountains. They pulled a 2-inch-wide, 10-foot-deep cylinder of sediment from the bottom of Kirman Lake and analyzed it in third-of-an­-inch sections, creating the most detailed and continuous paleoenvironmental record of California. 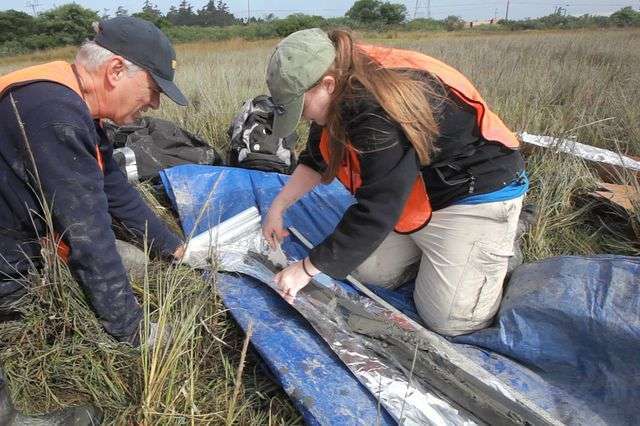 The team correlated their findings with other studies of California climate history, and for the first time, united all the studies and cross-referenced them with histories of the Pacific Ocean's temperature taken from marine sediment cores and other sources. What they found was not only that periods of increased radiative forcing could produce drought-like conditions that extended indefinitely, but that these conditions were closely tied to prolonged changes in Pacific Ocean surface temperatures. Changes in ocean temperatures are linked to El Niño and La Niña conditions, which increase and decrease precipitation in California. Until now, no one had the long, detailed record of California's dry periods needed to show that that aridity went hand-in-hand with changes in the prehistoric climate records of the Pacific Ocean, MacDonald said. "Climate models today have a challenging time predicting what will happen with Pacific sea-surface temperatures in the face of climate change, and we hope that our research can improve that," he added. The researchers chose Kirman Lake in central-eastern California for its sensitivity to climate changes and its stable geologic history. Today, it's a small, freshwater lake full of trout and about 16 feet deep, with a small marsh at one edge. The team found evidence though that through the millennia Kirman Lake has grown more and less salty, dried until it was exclusively marshland and refilled again. All the while, sediment accumulated on the lake's bottom, forming a record of lake conditions, the changing climate and the surrounding environment. single-celled algae and molecules of carbon and nitrogen give clues to the lake's depth and salinity, and the abundance or waning of plant and animal life. From 6,000 to 1,000 B.C., during a time geologists refer to as the mid-Holocene, the core sample captures a 5,000-year dry period in California that has been seen in less detail through other paleoenvironmental records. This arid period is linked to a slight variation in Earth's orbit that increased the amount of solar energy received by the Northern Hemisphere in the summer months. California was warm and dry, while marine sediment records show the Pacific was in a La Niña-like state, likely reducing precipitation. A similar dry period was seen from about 950 to 1250 B.C., a time known as the medieval climate anomaly. Increased radiative forcing and warming at this time is connected to decreased volcanic activity and increased sunspots. Again, La Niña appears to have reigned in the Pacific Ocean. "We suspected we would see the millennia of aridity during the mid-Holocene at Kirman Lake, but we were surprised to see a very clear record of the medieval climate anomaly as well," MacDonald said. "It was very cool to see the lake was sensitive on the scale of not just thousands of years, but also something that lasted just a few centuries." "This change at 2,200 B.C. was a global phenomenon," MacDonald said. "It's associated with the collapse of the Old Kingdom in Egypt. It's linked to the decline of the Akkadian Empire in Mesopotamia and similar Bronze Age societal disruptions in India and China. It was amazing to find evidence of it in our own backyard." That blip in the record was a reminder that El Niño and La Niña weather patterns have global repercussions. It also confirmed the accuracy and sensitivity of Kirman Lake's record, and the strong link between the ocean and California's weather. All this has consequences for California, the researchers said. Drought-like conditions can last indefinitely as long as increased warming, or radiative forcing, is present. And greenhouse gases are currently expected to increase. "In a century or so, we might see a retreat of forest lands, and an expansion of sagebrush, grasslands and deserts," MacDonald said. "We would expect temperatures to get higher, and rainfall and snowfall would decrease. Fire activity could increase, and lakes would get shallower, with some becoming marshy or drying up." California might remain an agricultural state, thanks to irrigation and engineering, though productivity might decrease and crops might change, said MacDonald, who emphasized that while the past is no guarantee of the future, in this case it does provide cause for concern. "I think we would find a way to keep our cities going through prolonged drought, but we're not going to engineer a way to conserve or preserve the ecosystems of the state," MacDonald said. "We can't save our huge expanses of oak woodlands, or our pine and fir forests, or high-elevation alpine ecosystems with irrigation projects like we might our orchards and gardens. I worry that we will see very different wildlands by the end of this century." But the Marxist Republic of California will take all necessary steps, no matter if they have to sacrifice every hetero X-chromosomed person of pallor not employed by entertainment or hi-tech, to ensure that the snail darter habitat is preserved and anyone making at least one million a year net of donations to the Marxist Party will be able to maintain their lush landscapes and wash the maid's Bentley.